In the "Clan of the Cave Bear" we met Ayla, the Cro-Magnon girl who had been clawed by a cave lion, separated from her parents, and abandoned in a small cave in ice age northern Europe. She was adopted by a Neanderthal tribe and endured many hardships until she left for the "Valley of the Horses." In that sequel Ayla domesticated two horses, a wolf, and a man, Jondalar, her mate-to-be. They joined the Mamutoi tribe in the "The Mammoth Hunters" and had fun killing mammoths and time while waiting for this book. Jondalar wants to return home to his Zelandonii kin and that trek will take him and Ayla west across the continent in the heart of an ice age winter. 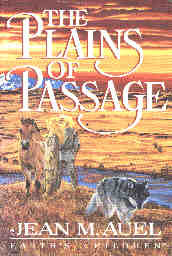 It will be their "Plains of Passage." Thus begins a gripping account of a European Winter Vacation for two people, two horses, and a wolf. The trip is punctuated by several near catastrophic river crossings, lost horses, lost wolf, separation of the two humans, kidnap and imprisonment by an Amazon tribe, healings by Ayla ( several broken bones set and lots of datura tea), visits to old friends of Jondalar, and a perilous trek across the glacier just before spring. Will Jondalar ever reach home? Will he and Ayla decide to found a hearth at one of their stops along the way? Will the horse hunters kill Whinny, Racer, and Jondalar? Will the Wolf Clan kill wolf and eat his flesh in their ritual sacrifice? Will Ayla rescue Jondalar from the Amazons in time? Will Jondalar be able to "find Ayla's mouth" one more time? Will they rest long enough for another steamy sexual romp in their sleeping furs? Will they make it across the glacier before the warm foehm winds form large crevasses in the ice? Will the horses be shot for food when their hooves begin to bleed on the glacier's surface? Will Ayla invent the wheel before the end of this book? These are samples of the questions I asked myself while reading and enjoying this book, maybe the best of the series. Auel's descriptions of life in the ice age are detailed and interesting. They add a didactic interest to an already enjoyable love story.